Beauty lovers, get ready! 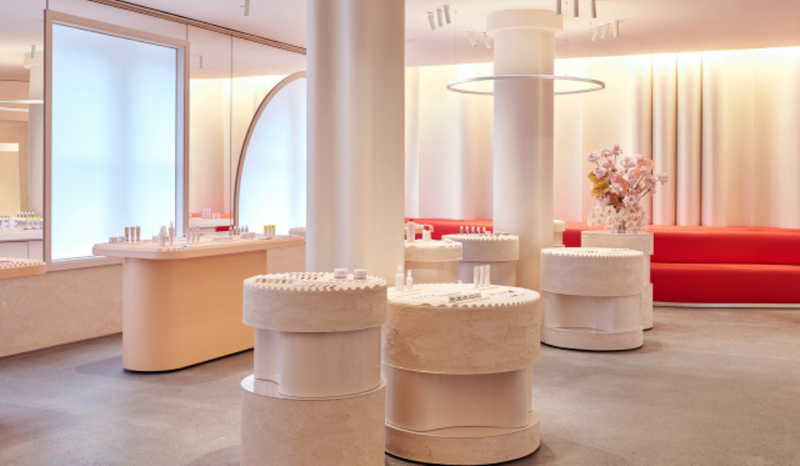 The ever growing start up, Glossier, is opening a new flagship location in Manhattan this week! For those of you in the beauty know, the name Glossier and their absolute takeover of the beauty industry since stepping on the scene in 2014 serves as a great example of the ever changing face of retail. Their two story expansion into a new retail space will come as no surprise. This new flagship, located at 123 Lafayette Street (the same location where their original, penthouse showroom suite was located) will be opening to the public this Thursday, November 8. The space, which features pink and red hued furniture, walls and display cases, will serve not only as a store but, as Glossier brand representatives put it, as “the ultimate physical expression of the brand” and a place for customers to meet, interact, create content and share experiences with other fans of the brand offline. According to Forbes, the nearly 3,000 square foot space will offer a new layout which serves to enhance the user experience both in the store and online. By implementing new user experiences such as a “wet area” where customers can test out products as if they were in the comfort of their own bathroom, as well focusing on developing new omni-channel technologies that allows customers to begin their purchase in store and finish online, Glossier is completely changing the way customers interact with their beauty and skin care purchases. And of course, the timing for the new flagship couldn’t be any better as Christmas shopping is about to begin! We can’t wait to check out the space and grab one of those Insta famous lipsticks.